What kind of things are touching the youth in Berlin’s Neighbourhoods, especially the teenagers coming from crisis regions like Irak, Syria, Ukraine and Afghanistan. 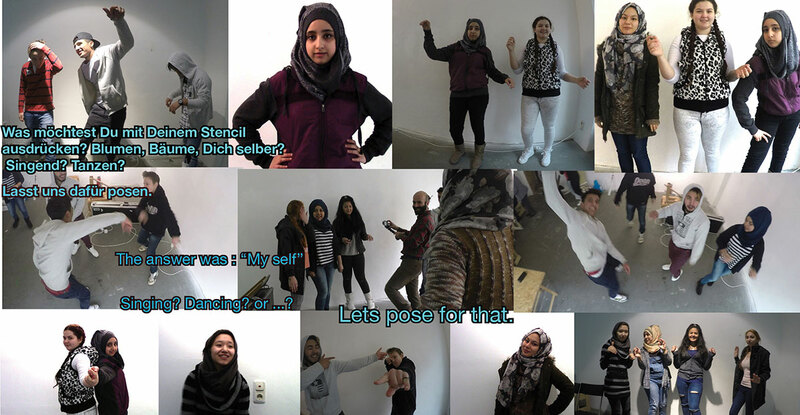 Stencil-Project with teenagers in public space + Final Exhibition in the rooms of Apartment Project Neukölln. We started on 20th Jan Friday with the help of the teacher Ioanna Scherff. We have 10 Youngsters, 6 girls, 4 boys. On the 1st day we show them the way we work and explain them the way we will work. They watch other projects. We had a break for 20 min. We eat all together, then we introduced Dan and Berk from the On/Off – Collective who were also joining the Workshop with their guidance and help. How we can prepeare an exhibition? Preparing stencils were the medium of the rap music video. so …how we can start? What would you like to express in a stencil? Flowers, trees, your self? Singing? Dancing? The answer was : “My self” Singing? Dancing? or …? Here are the pictures we’ve taken. We teach them how to translate this image with photoshop so that we can use it as a stencil. At the end everybody can tryout his stencil on a paper.